The best man’s speech is almost always one of the most exciting portions of any wedding day. In our experience as wedding and engagement photographers, the moment when a groom’s brother, cousin or best friend gets up to say a few words about the man who has just tied the knot with the love of his life is frequently thick with unpredictability and, as such, fraught with a certain amount of tension. At almost every wedding reception in the Washington, DC, metropolitan area that we have had the pleasure of photographing, the best man talks about how he knows the newly-married groom, tells a few embarrassing (but not too embarrassing!) stories about the man of the hour and concludes with some heartfelt words about how much the newlyweds love each other. But everybody knows that there is always the chance that the best man will stand up in front of the bride, the groom and all the invited wedding guests and say something that is a little too inappropriate or off-color for such an important occasion. That risk is what makes taking pictures of this portion of a marriage celebration in Washington, DC, so rewarding. Because the new husband and wife are often just a little bit nervous when the best man starts talking, every time he succeeds in making them laugh or tear up, those emotions are amplified by the relief they feel knowing that the speech is going well. As a result, the feelings that they feel in that moment are displayed in a way that is more obvious and that looks great when captured on film. 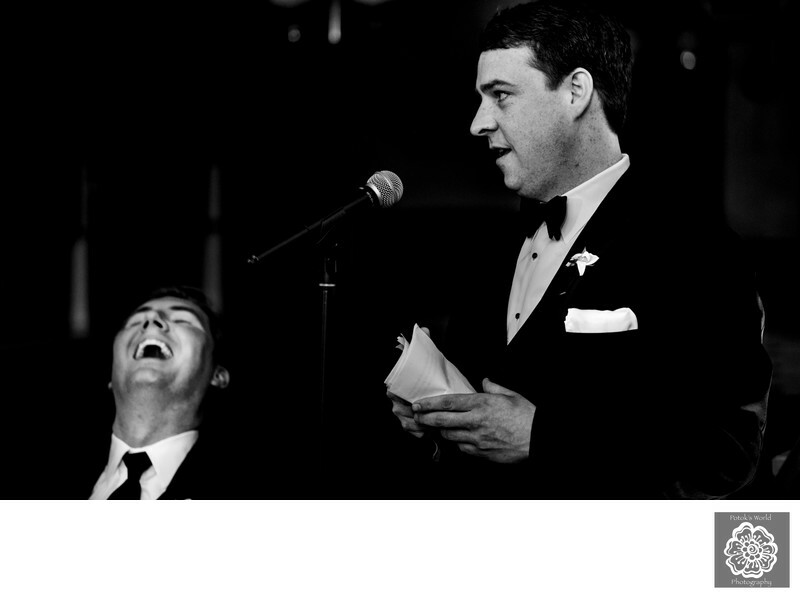 In this particular picture, for example, the groom is obviously laughing at a joke that the best man has just cracked. He is not just chuckling politely, though. The way that he is throwing his head back makes it clear that the groom is roaring with abandon. And unfettered and unreserved displays of emotions like that always make for the best wedding photography. We took this lovely photograph during a wedding reception at the George Peabody Library in Baltimore, Maryland. A research institution that is part of The Johns Hopkins University, the venue is a beautifully quirky spot for post-marriage ceremony celebrations and one of our personal favorite reception locations in Baltimore. The interior of the library, which has been described as a “cathedral of books,” is narrow but soars majestically more than 60 feet in the air. Three of the sides of the building’s six stories are divided into narrow little chambers that house row after row of bookshelves. On the night of this wedding reception, those nooks were lit with soft purple hues that combined beautifully with the strings of yellowish lights that ran between the balconies on either side of the room. The whole atmosphere reminded us of a scene in a Harry Potter movie, and as we took pictures of the wedding guests celebrating the nuptials of the bride and groom, we almost expected to see books floating magically between the shelves or young wizards soaring through the air above us. If you are a bride or groom looking for an offbeat but unforgettable venue for your wedding reception, we cannot recommend the George Peabody Library highly enough. Location: George Peabody Library, 17 E Mt Vernon Pl, Baltimore, MD 21202. Keywords: Baltimore Wedding Photographers (3), Maryland wedding (6).